Thank you to Allyson Zea for sharing this amazing flavored lemonade combination! Mix 1 cup sugar and 1 cup of water in a small sauce pan. Add 1/2 cup or more (a handful) of clean basil leaves to the pot. Bring to simmer over medium heat, stirring constantly to dissolve sugar. Reduce heat to low and simmer a minimum of 15 minutes, stirring occasionally. Remove from the heat and cool completely. Using a fine strainer, strain/pour the syrup into an airtight container. Discard leaves. Mix 1 cup sugar and 1 cup of water in a small sauce pan. Add 1/3 cup berries to the pot. Bring to simmer over medium heat, stirring constantly to dissolve sugar. Reduce heat to low and simmer a minimum of 15 minutes, stirring occasionally. (Be sure it is a low simmer or syrup may harden when cooled.) Remove from the heat and cool completely. Using a fine strainer, strain/pour the syrup into an airtight container. Discard berries. Juice lemons and add juice to a large pitcher taking care that there are no seeds. Add 1 cup sugar, 6 cups water, basil and blueberry simple syrups and stir to combine and dissolve sugar. Refrigerate for at least 1 hour prior to serving. 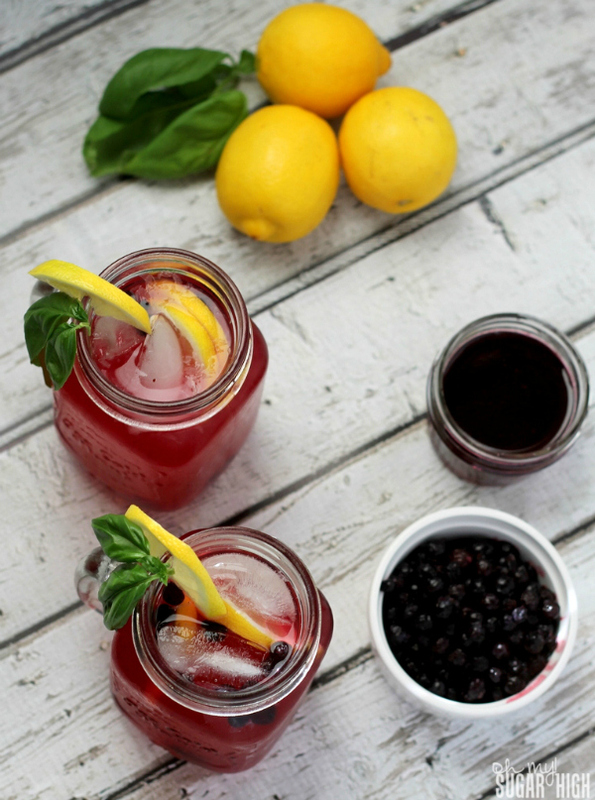 Serve in glasses with ice and garnish with lemons and blueberries. Yum! 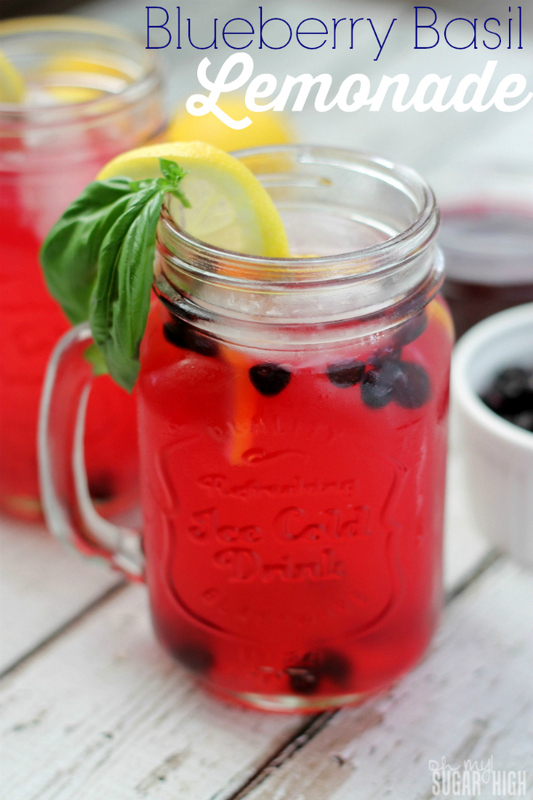 I have a ton of blueberries from picking and I should really make this. 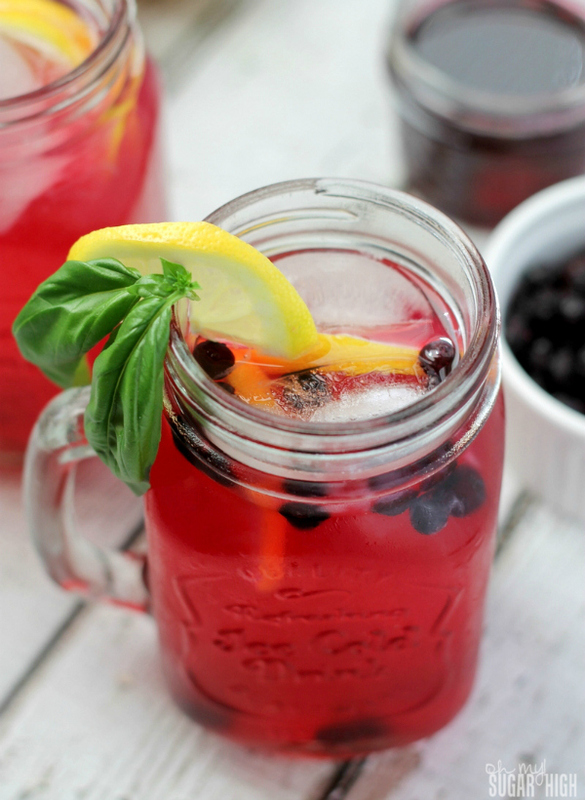 This looks like the perfect summer drink! Thanks for linking up with What’s Cookin’ Wednesday!